How to export an MXNet? Now, ToMXNetJSON returns a tuple, and it looks like the first element is the JSON for the symbol file. But I don't know what the second element is, and I don't have a clue as to what ToMXNetSymbol is returning. Motivation: A solution to this would enable one to take any net from MMA and run it in C or Python with GPU inference! It seems the model file in MXNet (checkpoint) is defined by two files: a ".json" file and a ".params" file. The json file contains the definition of the network, and the params file contains the actual weight and bias of each neuron. The params file is in the binary format of MXNet's NDArray representation. Thus, to export a network in Mathematica to MXNet, we need to generate these two files. The json file can be generated easily with the NeuralNetworks``ToMXNetJSON. The param file can be generated using the MXNetLink``NDArrayExport. Here is an example of this process using MNIST example in the documentation. We will now export the trained network into the MXNet's model files. Now the two files "MNIST-symbol.json" and "MNIST-0000.params" can be used to load the network in MXNet. To verify that the files are correct, we can use ImportMXNetModel to import MXNet model files we just generated. 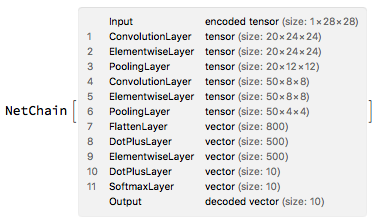 It seems that the structure of the implementation of neural network has been updated in 11.1. The trained weight is no longer in the NeuralNetworks``ToMXNetJSON. The trained weight can be accessed using NeuralNetworks``ToNetPlan. Not the answer you're looking for? Browse other questions tagged export machine-learning undocumented neural-networks mxnet or ask your own question. Simple example of NetGraph running in MXNet? How can I export my learned ClassiferFunction and PredictorFunctions? 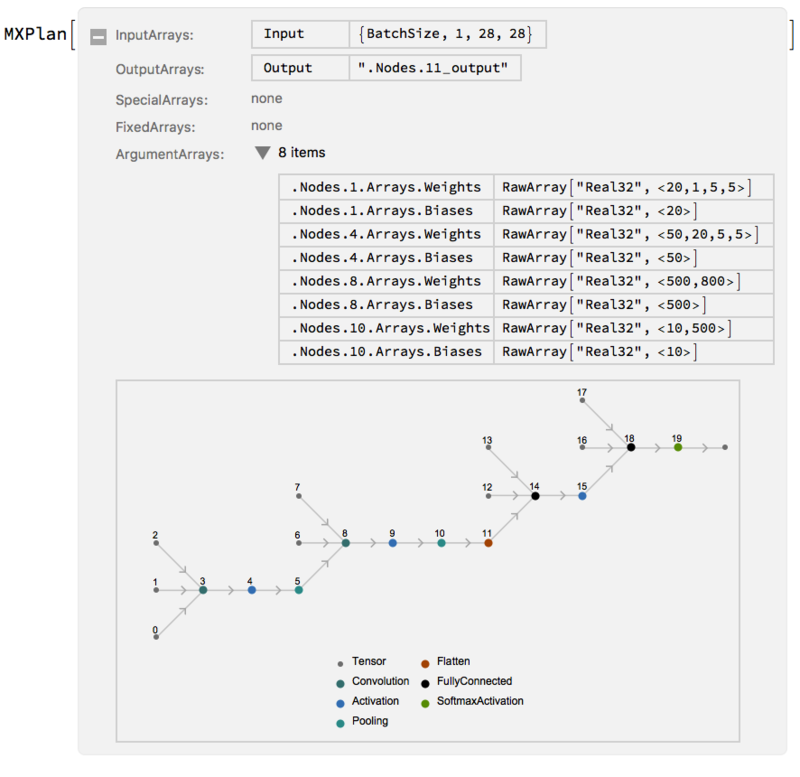 How can I import Mathematica's NetModel in MXNet-python and predict the image and get the same result/probability? Is is a bug when importing MXNet model? How can I reproduce the result of AgeEstimation model in MXNet-Python?